Classic Italian flavors combine in the satisfying, yet surprisingly light-tasting soup. 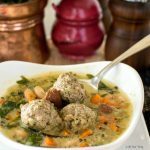 Rich broth, white wine, creamy beans, and hearty meatballs unite to form a marriage made in culinary heaven. Sweat the vegetables, garlic, and seasonings in oil in a large pot or Dutch oven, covered, over medium heat until soft, about 10 minutes. Add the smoked beef sausage quarters and continue to cook an additional 2 minutes. Deglaze with wine; reduce until nearly evaporated. Stir in broth and bring to a boil, reduce heat, and simmer covered 15-20 minutes. ** You will have extra meatballs. We made around 42. We put in around 30. *** If you like more substance in your soup you can add another can of cannelloni beans and/or small pasta such as patina, ditalini, or orzo. ****The eggs add richness and a creamy texture to the soup. Be sure to whisk them together well with a little bit of the hot broth. Add a little more of the hot broth once that is whisked in. This is called "tempering" and will help prevent the eggs from cuttingly when added to the hot soup.